› Author Affiliations Funding Research reported in this publication was supported by the National Center for Advancing Translational Sciences of the National Institutes of Health under award Number UL1TR001105. The content is solely the responsibility of the authors and does not necessarily represent the official views of the NIH. 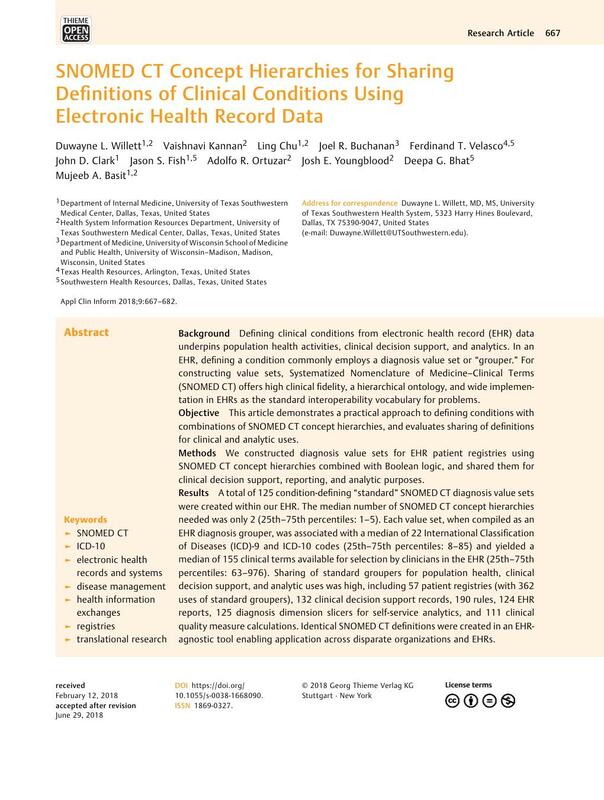 Background Defining clinical conditions from electronic health record (EHR) data underpins population health activities, clinical decision support, and analytics. In an EHR, defining a condition commonly employs a diagnosis value set or “grouper.” For constructing value sets, Systematized Nomenclature of Medicine–Clinical Terms (SNOMED CT) offers high clinical fidelity, a hierarchical ontology, and wide implementation in EHRs as the standard interoperability vocabulary for problems. Objective This article demonstrates a practical approach to defining conditions with combinations of SNOMED CT concept hierarchies, and evaluates sharing of definitions for clinical and analytic uses. Methods We constructed diagnosis value sets for EHR patient registries using SNOMED CT concept hierarchies combined with Boolean logic, and shared them for clinical decision support, reporting, and analytic purposes. Results A total of 125 condition-defining “standard” SNOMED CT diagnosis value sets were created within our EHR. The median number of SNOMED CT concept hierarchies needed was only 2 (25th–75th percentiles: 1–5). Each value set, when compiled as an EHR diagnosis grouper, was associated with a median of 22 International Classification of Diseases (ICD)-9 and ICD-10 codes (25th–75th percentiles: 8–85) and yielded a median of 155 clinical terms available for selection by clinicians in the EHR (25th–75th percentiles: 63–976). Sharing of standard groupers for population health, clinical decision support, and analytic uses was high, including 57 patient registries (with 362 uses of standard groupers), 132 clinical decision support records, 190 rules, 124 EHR reports, 125 diagnosis dimension slicers for self-service analytics, and 111 clinical quality measure calculations. Identical SNOMED CT definitions were created in an EHR-agnostic tool enabling application across disparate organizations and EHRs. Conclusion SNOMED CT-based diagnosis value sets are simple to develop, concise, understandable to clinicians, useful in the EHR and for analytics, and shareable. Developing curated SNOMED CT hierarchy-based condition definitions for public use could accelerate cross-organizational population health efforts, “smarter” EHR feature configuration, and clinical–translational research employing EHR-derived data. Creation of specialty registries at UT Southwestern was performed for quality improvement purposes and deemed exempt from institutional review board (IRB) review by UT Southwestern's IRB. Analysis of reuse and complexity of diagnosis groupers in the EHR did not involve human or animal subjects, and did not require IRB review.